April 2016 Adele and Theo Maraki celebrated 21 years in business. We service what we sell! 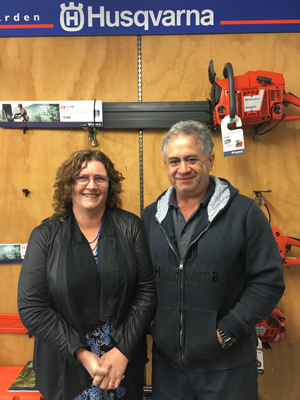 As forestry equipment specialists, you can rest assured that when it comes to purchasing the right product to suit your needs you are in the hands of the professionals at Kaikohe Lawnmowers & Chainsaws Ltd! We don't stop there! Our experienced mechanics provide quality repairs and service to most makes and models of 2 and 4 stroke small engines such as Chainsaws, Lawnmowers, Scrubcutters, Waterblasters, Generators, Pumps, Fireplaces, Bikes and more! To discuss your sales, servicing, repairs, parts & accessory requirements, be sure to get in touch with our friendly team today, we look forward to providing you with the solution you need and to see how we can best serve you!.